Bletchley Ladies put together back-to-back wins on Sunday but know they’ll have to be at their very best to make it a hat-trick next week. 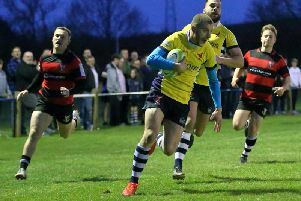 After beating Buckingham 27-17 in an attritional battle for their second league win of the season, Bletchley travel to league favourites Gloucester next weekend, who go into the game having scored 180 points in their last two outings, doing so without conceding. Despite falling behind, Bletchley rallied and drew level when Emma Taylor capitalised on a turnover, running in a try to make it 5-5. With the game ebbing and flowing, both sides had chances before Bletchley got their noses ahead before half time when Jodie Denton touched down in the corner for a 10-5 lead at the break. Emma Taylor added her second to extend the lead further two minutes into the second half, but Buckingham pulled it back to 15-10 with their second too just five minutes later. The sides exchanged tries once more, with Becky Driscoll giving Rachael Taylor a conversion before Buckingham too got another one to make it to make it 22-17. But Emma Taylor completed her hat-trick to put the game out of reach for Buckingham at 27-17.